Offering you a complete choice of products which include wheat roller flour mill. 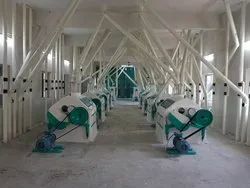 We are manufacturer of Flour Mills having capacity from 50 ton per day to 500 tons per day for good and healthy quality of flour for biscuit, bread and chapatti. Roll Bodies Made from Cast Iron & Heavy Duty. MS Fabricated Worms, Pneumatic Lift, Cyclones, HP / LP Fans. Low noise / low vibration Plan Sifters.